Check out Tobi's Olly Off Shoulder Shift Dress The Red Olly Off Shoulder Shift Dress makes it so easy. In a soft knit with half length sleeves, the off shoulder dress has a chic bardot neckline and cute swing shape. Heels or sneaks, this shift dress can be dialled up or down for whatever you're feeling that day. The Grey Olly Off Shoulder Shift Dress makes it so easy. In a soft knit with half length sleeves, the off shoulder dress has a chic bardot neckline and cute swing shape. Heels or sneaks, this shift dress can be dialled up or down for whatever you're feeling that day. The Mauve Olly Off Shoulder Shift Dress makes it so easy. In a soft knit with half length sleeves, the off shoulder dress has a chic bardot neckline and cute swing shape. Heels or sneaks, this shift dress can be dialled up or down for whatever you're feeling that day. The Red Olly Off Shoulder Shift Dress makes it so easy. In a soft knit with half length sleeves, the off shoulder dress has a chic bardot neckline and cute swing shape. Heels or sneaks, this shift dress can be dialled up or down for whatever you're feeling that day. 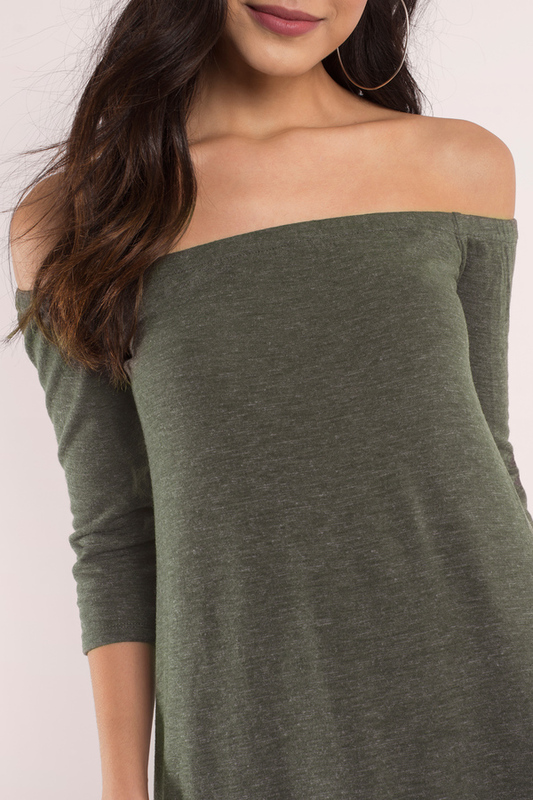 The Olive Olly Off Shoulder Shift Dress makes it so easy. In a soft knit with half length sleeves, the off shoulder dress has a chic bardot neckline and cute swing shape. Heels or sneaks, this shift dress can be dialled up or down for whatever you're feeling that day. The Black Olly Off Shoulder Shift Dress makes it so easy. In a soft knit with half length sleeves, the off shoulder dress has a chic bardot neckline and cute swing shape. Heels or sneaks, this shift dress can be dialled up or down for whatever you're feeling that day. Model's profile: height 5'8", bust 32", waist 24"